Do you have the SaferCar Mobile App? In March of 2013 NHTSA (National Highway Traffic Safety Administration) announced a new iOS app for iPhones and iPod Touches as well as Android phones. 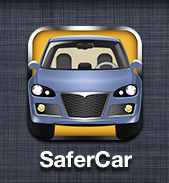 This app provides real-time vehicle safety information to the consumers from NHTSA's SafeCar.gov website. The app allows the users to search the 5-star safety ratings for vehicles by the make and the mode, locate car seat installation help. file vehicle safety complaints, find recall information, and subscribe to automatic notices about vehicle recalls. With all the problems we have been having with GM and other car companies this year so far, this app will be a great way to stay on top of key information like that. Many consumers already rely on this data to inform their purchasing decisions on popular automobile review sites; now they will be able to access this data in real-time. The SaferCar app can be found on both iTunes Store and the Android Market. After you download the app, make sure to register your vehicle, tires and car seats (if any). This will ensure that you receive NHTSA notifications when the manufacturers files the recall with the federal government. Technology has come a long way and to be able to get real-time information about your vehicle or car seat is an amazing thing. As a consumer, you want to be in "the know" about what is going with your vehicle, and this app helps give you the information you need to keep you and your family safe while driving. For more on the SaferCar Mobile app, head over to www.nhtsa.gov. And always as a reminder; Don't use your cell phone while driving! The attorneys here at Donahoe Kearney, LLP have handled many personal injury cases getting our clients the results they need and deserve. If you have been seriously injured in an accident that was caused by a vehicle on the recall list, reach out to us, let us know how we can help you. Even if we cannot take your case, we can refer you to attorneys we know and trust.